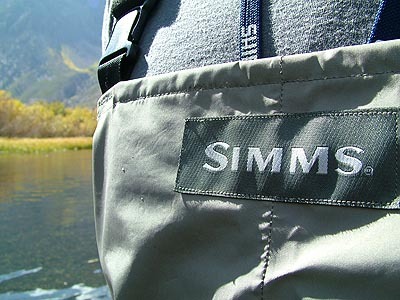 Introduction: Simms has built a well deserved reputation for supplying guide quality waders and fly fishing garments to anglers that place heavy demands on their apparel. There is no question that the premium priced G3 and Guide series waders are top notch products, but what about the company's more affordable solutions? We take a look at the mid-range Lightweight Stockingfoot series to see if these waders are still able to satisfy the most discriminating Simms aficionados. Impressions: Over the last few seasons I have relied on a pair of discontinued Redington waders for all my wade fishing. I loved this pair of waders for the quality construction and many features including wading belt loops, integrated gravel guards, triple lined lower padding, and included travel bag. Unfortunately a year ago I broke my knee and the joint was never quite the same. While I regained complete mobility I am unable to withstand any direct pressure on my kneecap. This posed a major problem as the armor pads on the Redington I once loved now caused me great discomfort with each and every step. I had to find a pair of waders that were very durable, but had no thick padding in the lower half. Enter the Simms LWS (Lightweight Stockingfoots). The LWS waders are positioned in between the very popular Classic Guide Stockingfoots (329.95) and the affordable Freestone waders (149.95). The major differences between these three waders is the material used in their construction. The Classic Guide and Lightweight make use of Gore-Tex while the FreeStone is built with waterproof Quadralam. The Classic Guide makes use of the same basic materials as the Lightweight but features many more layers, and benefits from superior lower unit reinforcement. 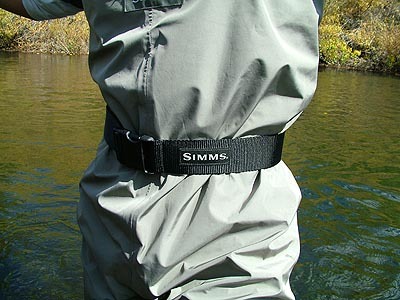 With the exception of the brand new G3 Guide series most Simms waders put an emphasis on a simple and reliable design. The LWS waders are extremely lightweight for a Gore-Tex wader and are able to pack away very small. Upon initial inspection I was impressed the the wader's construction. Every seam is well stitched and layered, and the buckles locked securely. While my initial impressions were positive the only way to really test them was to get them wet. The Field Tests: I always take great pleasure in testing fly equipment as it gives me a good excuse to head for the hills. 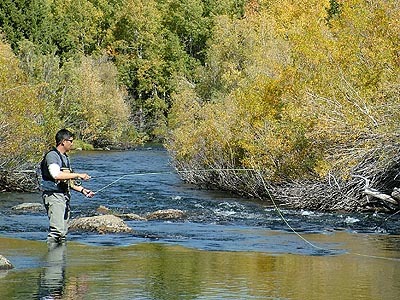 Surrounded by some of the most gorgeous scenery in the mountains it is easy to forget what time it is as hours upon hours are spent casting fly lines in alpine streams. For the Simms LWS field tests I head for the Eastern Sierras and fished fall colored streams in Bishop, Mammoth, and in the June Loop. This beautiful setting proved to be the ideal testing ground for an angler on the go, as I was often packing and unpacking to reposition myself along various streams. During the field tests I split my time fly fishing and spin fishing to test the waders in a variety of mixed applications. Materials: What sets a Simms wader apart from the competition? Probably the company's attention to detail, combined with use of the latest technologically advanced materials. The LWS waders are among the lightest Gore-Tex breathable waders on the market. On this particular product the trick was to design a wader that is extremely durable yet still light and small enough to pack and travel anywhere the fishing is good. 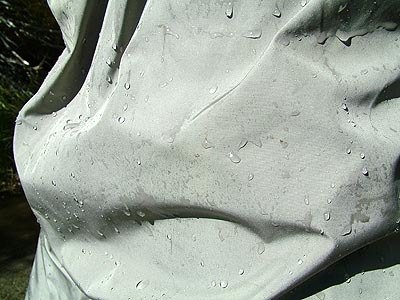 The wader gains it's waterproof characteristics from the Gore-Tex fabric. Reinforced lamination on the lower leg offers some puncture protection, and 3mm high density neoprene is used for the stockingfeet. 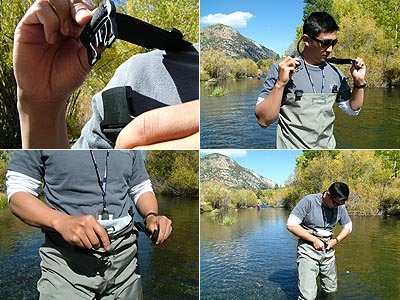 Features: the first feature of this wader is the easy on and off. Featuring a generous cut the wader is designed to slip on and off with minimal effort, and is a world better than any neoprene wader. While not as feature rich as some competitor products the LWS does have some elements worth noting. The LWS comes with a standard flip out chest pocket, good for stowing small items. The most innovative feature is the suspender straps. They feature a secure clicking mechanism that is very flat so that they don't dig into your chest. They also are able to snap into each other directly so that on hot days you can wear the LWS as a waist high wader by using the shoulder straps as a wading belt. Finally the LWS is treated to be DEET and saltwater resistant, and each and every pair is manufactured and water tested in Bozeman, Montana.